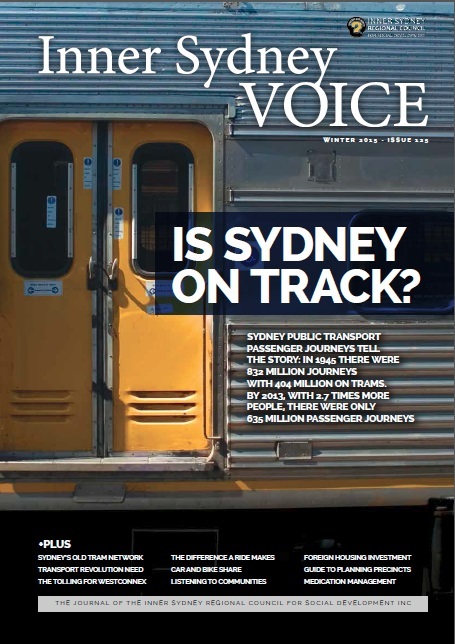 This issue we have a focus on transport. Sydney was shaped by its transport from developing along Aboriginal walking tracks and waterways to spreading along the new roads, tram and rail lines. In 1945 Sydney had one of the world’s largest and most used public transport systems supported by 291 kilometres of light rail. It was ripped up to make room for the car and the city spread rapidly as transport became car focused. Trams are now being reintroduced and there is a new push for Transport Orien­tated Design built around public transport, walking and cycling. But as planners talk of avoiding the problems of the past, the Federal Government is funding new roads like WestConnex as part of a renewed car push to create a Sydney orbital freeway network. Tim Williams from Committee for Sydney recently argued that this road focus and the power of the Roads and Maritime Services made RMS the real spatial planners for Sydney not the Department of Planning. He called for a grown up dialogue about the need for a public transport revolution. In Towards the transport revolution Sydney needs we look at some of the issues raised. For the big picture we asked Ecotransit in Trams: Rebuilding what was lost to look at Sydney’s historical tram network and what should be rebuilt. We also asked them How does public transport stack up against motorways?. With no government business case for WestConnex, we went looking elsewhere for the toll figures needed to make WestConnex viable. The result is Mehreen Faruqi’s Will WestConnex take its toll? Transport is ultimately about people and the difference it makes, or could make, for people now and into the future. Three transport stories from people in Western Sydney illustrate What a difference a ride makes. Transport options are also changing and in New alternatives to car ownership we explore the choices provided by car and bike share schemes in the inner city. We have two articles in this issue on community engagement. In Community engagement or community capture Michael Darcy looks at limitations of community engagement when so much is not negotiable in consultations. While in Turning outwards to listen to communities Brian Smith discusses some processes from The Harwood Institute that are allowing commu­nity centres to better listen to their communities. In human services we explore the difficult issue of Medication Management in the Community. The furphy of human services sustainability looks at the latest grant fad where projects have to show they will be sustainable after an initial funded period to receive funding. In the urban renewal we look at the fear of Chinese investment in Is Housing Affordability a Foreign or Domestic Investment Problem? and with consultations happening around the Bays Precinct and Central to Eveleigh we reproduce work by some Sydney University architects who put together A guide to achieving good precinct planning outcomes. And finally from the Inner Voice Vault we celebrate the long campaign of Action for Public Transport with a report from Inner Voice in March 1978 Saving Public Transport. Co-editors Inner Sydney Regional Council for Social Development.